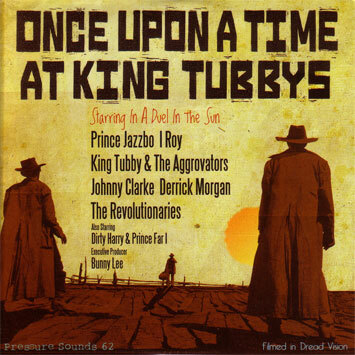 'Once Upon A Time At King Tubby's' captures from start to finish the full story of the most well known, and certainly the wittiest, of all the wars of words that the highly competitive Kingston recording scene ever produced. I Roy and Prince Jazzbo were the principal players aided and abetted along the way by an assorted bunch of onlookers and minor characters who all helped the drama to unfold. Bunny 'Striker' Lee was the catalyst that started this particular schism and the producer of all but one of the tracks. Ever the entrepreneur 'Striker' hit the musical jackpot once again as he goaded both artists into making records that went 'straight to the head'. What had begun as a joke grew into an entire series of seven inch singles that set the Jamaican recording scene alight in the mid seventies. All but one of the tracks on this set were voiced and mixed at King Tubby's Waterhouse studio; I Roy voiced 'Padlock' at Channel One “because the competition a get so crabbit” and this gave veteran vocalist Derrick Morgan an opportunity to enter the fray. Johnny Clarke, Dirty Harry and Prince Far I also make cameo appearances. Musical feuds and 'head' games are nothing new in Jamaican music but this album is probably the first album to compile all the tracks from one of the best examples of 'feuds' that ever happened. A killa release. Remastered and with full sleeve notes. This album contains some of the wittiest put downs ever released.